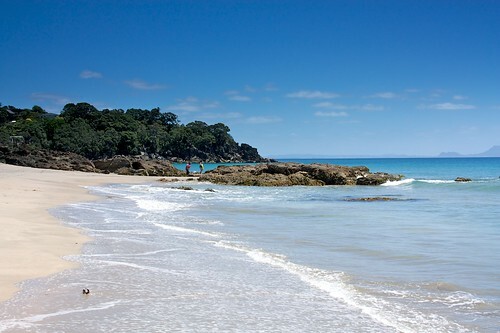 With 17,000 kilometres of coastline, New Zealand is bound to have a few good beaches, right? Absolutely! New Zealand has some wonderfully scenic beaches. Along the East Coast of the country you’ll generally find golden sandy beaches – the best of which are in Northland, the Coromandel and Golden Bay. These are the most popular places for a classic Kiwi summer – camping, swimming and evening BBQs. The West Coast is home to black, volcanic sand beaches which can be just as pretty in a moodier way – great for long walks, sunsets and surf. The West Coast is home to many of the bigger surf breaks. Compared to our other Pacific neighbours, the seas that lap at New Zealand beaches aren’t all that warm. You probably won’t want to swim in the sea outside of the summer season or further south than Nelson. Always swim between the flags as drownings are an all too frequent occurence. The water may looks calm enough on the surface but this can be deceptive. Know how to spot a rip and avoid it. Check out this video on beach safety. About an hour and a half north of Auckland, on the East Coast, you’ll find Langs Beach. The sand is powdery, the water is great for swimming & body surfing, Rata trees line the beachfront and uninhabited islands dot the sea in the distance. Lang’s is a popular spot for holidaying Aucklanders and many of the holiday homes here belong to the city’s elite. It makes a great stop if you’re driving North to Whangarei. 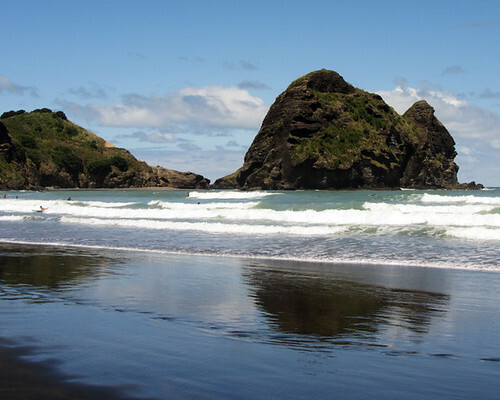 Piha is Auckland’s favourite surf beach. Drive through the Waitakere Ranges and stop off for a walk in the native rainforest before hitting the beach. Surfer’s will be in heaven. The beach is patrolled but can be dangerous for swimming, so much so that there’s a reality show about the lifesavers who work here (Piha Rescue). Less than an hour from Auckland’s CBD, Piha makes for a lovely day out on the wild West coast. 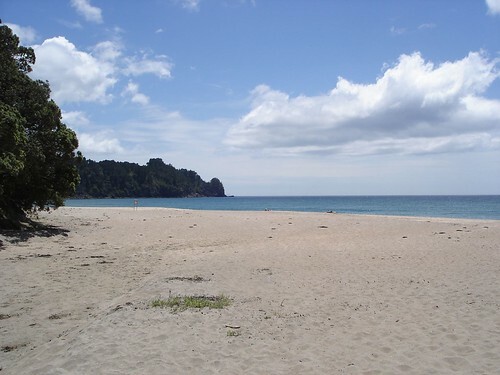 The Coromandel Peninsula, two hours from Auckland, is home to many of the best beaches in New Zealand. Hot Water Beach is a favourite with tourists. An underground river of volcanically heated water runs beneath the beach and at low tide you can dig your own thermal bath right on the beach. Plan on arriving an hour before low tide and bring something to dig yourself a hole (cutting the end off a plastic milk bottle works well). You won’t be the only one doing it! It’s very popular with tourists. Whangamata is the gem of the Coromandel. It’s a beautiful white sandy beach with a big enough town making it a good place to stay for a few days. There are great cafes, plenty of holiday homes for rent, hostels and campgrounds. Book ahead in summer as it’s an incredibly popular spot for New Year’s Eve and school holidays. 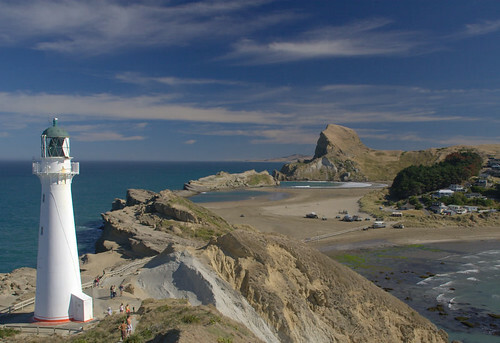 Castlepoint is fantastically scenic but a little out of the way. An hour’s drive from the small town of Masterton or two hours from Wellington, Castlepoint is a great place to watch the sun rise or surf. Golden Bay sits at the very tip of the South Island, it just out so far that it’s actually further North than Wellington. As the name suggests, the beaches in Golden Bay and the neighbouring Abel Tasman National Park glisten with golden coloured sand. If you’re in New Zealand during Summer it’s well worth the trip even if the road between Motueka and Takaka is gut-wrenchingly windy. It’ll take almost two hours to reach Pohara from Nelson. You’ll find some of New Zealand’s best scenary down on the wild West Coast of the South Island. Black volcanic sands are hammered by big, choppy waves which provide an achingly beautiful backdrop for aspiring photographers. After you’ve taken a walk around the famous pankcake rocks, sunset is a perfect time to see the beaches at Punakaiki. While there’s accommodation in town, there isn’t much else so you’re probably better to daytrip from Greymouth which is only 30 minutes away. 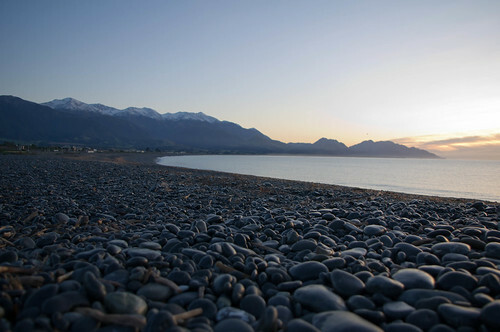 Literally translated to where the mountains met the sea, Kaikoura is the best place in New Zealand for observing nature in all it’s glory. You may visit for the abundance of wildlife including whales, dolphins, seals and penguins… but you’ll stay for the jaw-dropping vistas of a perfectly curved stony beach set against the backdrop of snow capped mountains. New Zealand at it’s unadulterated best. Not far from Christchurch, Akaroa is an adorable village out on the Banks Peninsula that retains it’s French heritage and attracts tourists in their droves. You can swim with dolphins, lunch at wineries and sample gourmet cheese. With a little extra time you can quickly get away from the bus-loads of daytrippers and find yourself your own quiet little beach. If a long walk on a lonely beach is what you crave, Le Bons Bay is the perfect spot. 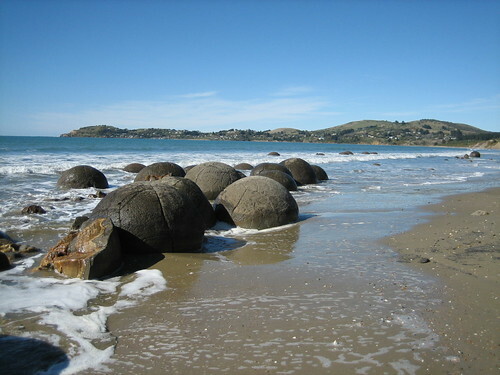 If it’s other wordly you seek, you’ll find it on Koekohe Beach – home to the Moreaki boulders. Scores of boulders dot the beach’s landscape in a most peculiar way, smoothed and shaped over time producing clusters of spheres that look more like an art installation than a natural feature. You’ll find Koekohe beach on the drive between Oamaru and Dunedin. Keep an eye out for penguins along this stretch of coast. 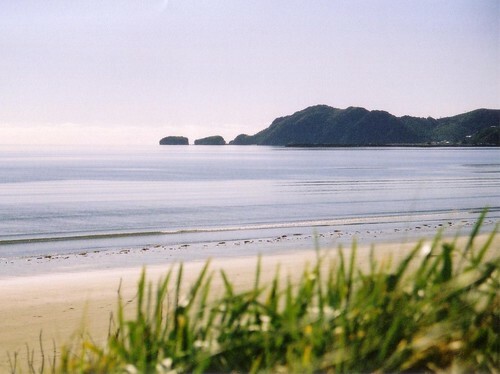 Have you been to any of these great beaches in New Zealand? What’s your favourite? If you haven’t been to New Zealand yet, which of these looks the most appealing to you? Interesting about Kaikoura too! I was under the impression that it had to do with the many crayfish (koura) in the area. I’m lucky enough to live in the Canary Islands. But that doesn’t stop me wanting to visit these beaches. Fantastic selection, well done. Hot Water Beach and Punakaiki are my favorites as well, I also really liked the little beaches around Golden Bay. I have been pining to get to the beach! Like Matthew, I reside in Spain, but it’s been all rain and cold here recently in the Northern Hemisphere! Looks beautiful. Will share your photos. Great post as usual Bethaney – you’ve listed some good ones like Langs that are relatively unknown except to locals. The scenery is so beautiful in New Zealand, so even though the water may be cold the beaches are still worth the trip. We spent a week in Taieri, south of Dunedin. The rocky coast was beautiful, and I loved all the lupine growing in the dunes! Awesome spots…being from Florida, I’m a little jaded for the beach. But we don’t have beaches like this in Florida! I tired to distributed them fairly throughout the country Cole… otherwise that might have ALL been in the Coromandal! Aww, Langs beach looks so lovely! Great post – and some stunning photos – despite living in NZ for over 2 years, I reckon i’ve only been to 2 of those beaches. I’ll have to return!